The house by the Sherwood Mill Pond footbridge leading to Compo Cove is being raised. You can see the work from Old Mill Beach — and far beyond, at Schlaet’s Point on Hillspoint Road. It’s an iconic Westport site. Originally a grist mill — destroyed at least once by fire — it has been a private residence since the early 1900s. Like its predecessor, the home straddles the water. 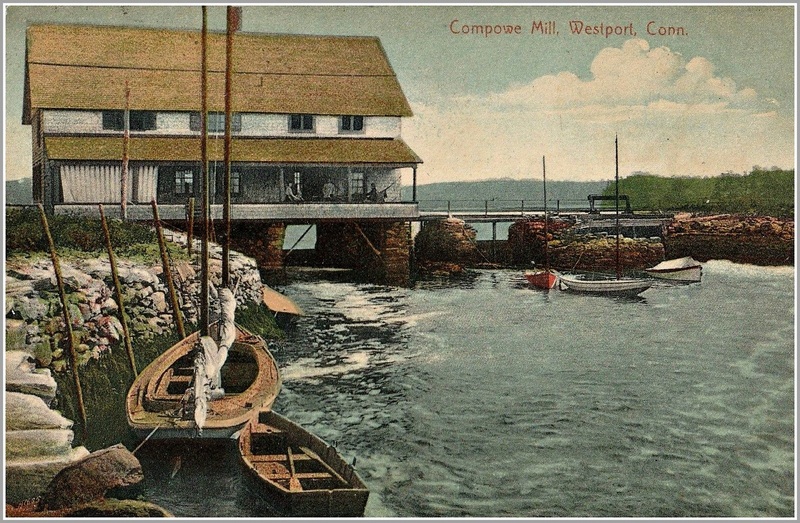 You can’t see the “old mill” that gave the beach and neighborhood its name. But you can sure tell that the scene is timeless. 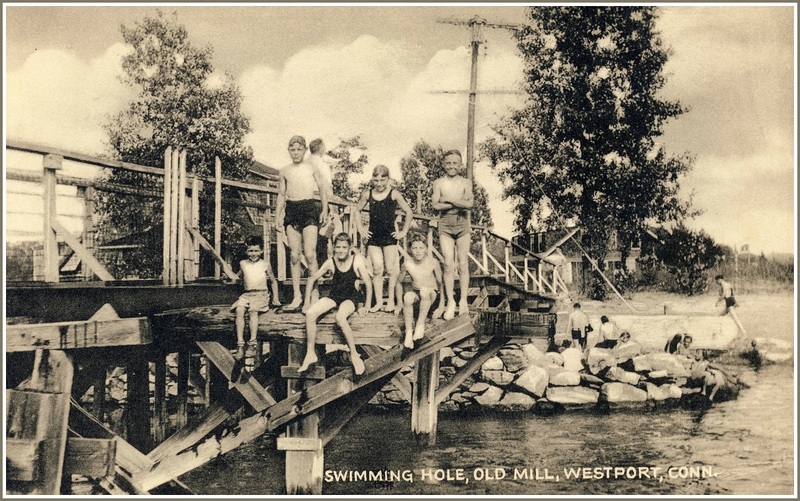 This entry was posted in Beach, Friday Flashback and tagged Compo Cove, Old Mill Beach, Sherwood Mill Pond. Bookmark the permalink. Why is the house being razed? Will something else go there? I always liked the house in that curious setting but never knew anything about it. Peter, it’s being “raised,” not “razed.” There’s quite a difference! Thanks Dan! That area (Old Mill Beach, Compo and Bluewater Hill, was the BEST place on earth to grow up!) I was disappointed when my father sold our house and we moved to 112 Roseville which had, perhaps, the most dangerous driveway in Westport (directly across from Whitney Street). The picture of the house is a “tinted photo” meaning that the original black and white picture was hand-colored, then printed, a common practice back then. Many tinted photos looked pretty phoney but this one is very nice, the color is minimal and subtle giving a classical look when you see it enlarged. On “Schlaet’s Point” there are a number of 06880 features with this whole story. TRUE, A.KING AND KATIE ATKIN DID OWN AND LIVE THERE. PETER AKIN OF BLACK DUCK FAME IS THEIR SON. THEY ALSO HAD A DAUGHTER, ANNE. DON’T KNOW HER STORY.